*PaperMBL은 가장 쉽고 착한 MBL(Microcomputer Based Laboratory) 장치입니다. *장치구입은 이메일로 문의하시기 바랍니다. [email protected] *이 앱은 AppyBuilder로제작하였으며,차트 작성을 위해 Chart.js를 사용합니다. Chart.js is open source andavailableunder the MIT license.http://appybuilder.comhttps://www.chartjs.org *사용방법 1. 같은 농도의 염산과수산화 나트륨 수용액을 준비합니다. 2.PaperMBL 장치를 스마트폰의 USB포트에 OTG케이블로 연결합니다. 3.앱에서 용액 A의 온도 셀을 선택합니다.4. 염산 2mL와 수산화 나트륨 수용액 10mL를 섞고, 온도 센서를 넣습니다.5. PaperMBL 장치의 [연속]버튼을 누르면 온도가 1초에 한 번씩 갱신되고, 차트가 그려집니다. 6.PaperMBL 장치의 [연속]이나 [단일]버튼을 누르면 측정을 멈춥니다. 7. 다른 용액(B, C, D, E)에대해서도 위 3~6번을 반복합니다. *블루투스를통한 실시간 자료(차트) 공유 기능을 추가할 예정입니다. *PaperMBL is the easiest and bestMBL (Microcomputer BasedLaboratory) device. * Please contact us bye-mail to purchase thedevice. [email protected] * This app wascreated with AppyBuilderand uses Chart.js for charting. Chart.jsis open source andavailable under the MIT license.http://appybuilder.comhttps://www.chartjs.org *How to use 1.Prepare the sameconcentration of hydrochloric acid and sodiumhydroxide solution. 2.Connect the PaperMBL device to the USB portof your smartphone withthe OTG cable. 3. In the app, select thetemperature cell forsolution A. 4. Add 2 mL of hydrochloric acidand 10 mL of aqueoussodium hydroxide solution, and insert thetemperature sensor. 5.Press the [Continue] button on the PaperMBLunit to update thetemperature once a second and draw a chart. 6.Press the [Continue]or [Single] button on the PaperMBL unit tostop the measurement. 7.Repeat steps 3 to 6 for other solutions(B, C, D, E). * We will addreal-time data (chart) sharing functionvia Bluetooth. *PaperMBL은 가장 쉽고 착한 MBL(Microcomputer Based Laboratory) 장치입니다. *장치구입은 이메일로 문의하시기 바랍니다. paper[email protected] *이 앱은 AppyBuilder로제작하였으며,차트 작성을 위해 Chart.js를 사용합니다. Chart.js is open source andavailableunder the MIT license.http://appybuilder.comhttps://www.chartjs.org *사용방법 1. 같은 농도의 염산과수산화 나트륨 수용액을 준비합니다. 2.PaperMBL 장치를 스마트폰의 USB포트에 OTG케이블로 연결합니다. 3.앱에서 용액 A의 전기전도도 셀을선택합니다. 4. 염산 2mL와 수산화 나트륨 수용액 10mL를 섞고, 전도도 측정전극을 넣습니다. 5.PaperMBL 장치의 [연속] 버튼을 누르면 전도도가 1초에 한 번씩 갱신되고, 차트가그려집니다. 6.PaperMBL 장치의 [연속]이나 [단일] 버튼을 누르면 측정을 멈춥니다. 7. 다른 용액(B, C,D, E)에대해서도 위 3~6번을 반복합니다. *블루투스를 통한 실시간 자료(차트) 공유 기능을 추가할 예정입니다. *PaperMBL is the easiest and best MBL (MicrocomputerBasedLaboratory) device. * Please contact us by e-mail to purchasethedevice. [email protected] * This app was created withAppyBuilderand uses Chart.js for charting. Chart.js is open sourceandavailable under the MIT license.http://appybuilder.comhttps://www.chartjs.org *How to use 1.Prepare the sameconcentration of hydrochloric acid and sodiumhydroxide solution.2. Connect the PaperMBL device to the USB portof your smartphonewith the OTG cable. 3. Select the electricalconductivity cell ofSolution A in the app. 4. Mix 2 mL ofhydrochloric acid and 10 mLof sodium hydroxide solution, and insertthe conductivity-measuringelectrode. 5. Press the [Continue] buttonon the PaperMBL unit toupdate the conductivity once every second,and draw the chart. 6.Press the [Continue] or [Single] button onthe PaperMBL unit tostop the measurement. 7. Repeat steps 3 to 6for other solutions(B, C, D, E). * We will add real-time data(chart) sharing functionvia Bluetooth. *PaperMBL은 가장 쉽고 착한 MBL(Microcomputer Based Laboratory) 장치입니다. *장치구입은 이메일로 문의하시기 바랍니다. [email protected] *이 앱은 AppyBuilder로제작하였으며,차트 작성을 위해 Chart.js를 사용합니다. Chart.js is open source andavailableunder the MIT license.http://appybuilder.comhttps://www.chartjs.org *사용방법 1. 물 400mL를 넣은비커를 자석교반기에서 교반한다. 2.막대 전극을 비커에 기울여 넣는다. 3. PaperMBL 장치를 스마트폰의USB포트에 OTG케이블로 연결한다. 4.PaperMBL 장치의 집게 전선 2개를 막대 전극에 연결한다. 5.PaperMBL 장치 [연속] 버튼을 눌러서전도도를 측정한다. 6. 값이 안정화 되면 앱에서 다음 셀을 선택한다. 7.비커에 용질을 넣고 값이 안정화 되면 앱에서다음 셀을 선택한다. 8. 위 7번 과정을 반복한다. *블루투스를 통한 실시간자료(차트) 공유 기능을 추가할예정입니다. * PaperMBL is the easiest and good MBL(Microcomputer BasedLaboratory) devices. * Device purchase, pleasecontact us bye-mail. [email protected] * This app was madeAppyBuilder, use theChart.js to create the chart. Chart.js is opensource and availableunder the MIT license.http://appybuilder.comhttps://www.chartjs.org *How to use 1.stirring into a beaker ofwater in 400mL magnetic stirrer. 2. Tiltthe bar electrodes placedin a beaker. 3. Connect the device toPaperMBL OTG cable to a USBport on your smartphone. 4. The forcepswire 2 of PaperMBL deviceis connected to a rod electrode. 5. Pressthe PaperMBL device CONTbutton measures the conductivity. 6. If thevalue is stabilizedselects the next cell in the app. 7. When placedin a beaker solutevalue is stabilized selects the next cell in theapp. 8. Repeat theabove procedure seven times. * Real-time data viaBluetooth(Charts) will add sharing capabilities. *PaperMBL은 가장 쉽고 착한 MBL(Microcomputer Based Laboratory) 장치입니다. *장치구입은 이메일로 문의하시기 바랍니다. [email protected] *이 앱은 AppyBuilder로제작하였으며,차트 작성을 위해 Chart.js를 사용합니다. Chart.js is open source andavailableunder the MIT license.http://appybuilder.comhttps://www.chartjs.org *사용방법 1. PaperMBL 장치를스마트폰의 USB포트에 OTG케이블로연결합니다. 2. 이 앱의 아래쪽 버튼으로 출력 형태를 선택합니다. 3.PaperMBL 장치에 연결된 센서를 측정대상에 접촉시킵니다. 4. PaperMBL 장치의 [단일] 또는 [연속] 버튼을누르면 측정값이 입력됩니다. 5. 이앱의 아래쪽 버튼으로 출력 형태를 변경할 수 있습니다. *블루투스를 통한 실시간자료(차트) 공유 기능을 추가할예정입니다. * PaperMBL is the easiest and good MBL(Microcomputer BasedLaboratory) devices. * Device purchase, pleasecontact us bye-mail. [email protected] * This app was madeAppyBuilder, use theChart.js to create the chart. Chart.js is opensource and availableunder the MIT license.http://appybuilder.comhttps://www.chartjs.org *How to use PaperMBL1. Connect the deviceto the OTG cable to the USB port on yoursmartphone. 2. Select theoutput format button at the bottom of theapp. 3. PaperMBL contactwith the sensor connected to the device tobe measured. 4. Themeasured value is entered by pressing the[Single] or [continuous]button PaperMBL device. 5. You can changethe output format buttonon the bottom of the app. * Real-time datavia Bluetooth (Charts)will add sharing capabilities. *PaperMBL은 가장 쉽고 착한 MBL(Microcomputer Based Laboratory) 장치입니다. *장치구입은 이메일로 문의하시기 바랍니다. [email protected] *이 앱은 AppyBuilder로제작하였으며,차트 작성을 위해 Chart.js를 사용합니다. Chart.js is open source andavailableunder the MIT license.http://appybuilder.comhttps://www.chartjs.org *사용방법 1. 같은 농도의 염산과수산화 나트륨 수용액을 준비합니다. 2.PaperMBL 장치를 스마트폰의 USB포트에 OTG케이블로 연결합니다. 3.앱에서 용액 A의 전기전도도 셀을선택합니다. 4. 염산 2mL와 수산화 나트륨 수용액 10mL를 섞고, 전도도 측정전극을 넣습니다. 5.PaperMBL 장치의 [연속] 버튼을 누르면 전도도가 1초에 한 번씩 갱신되고, 차트가그려집니다. 6.PaperMBL 장치의 [연속]이나 [단일] 버튼을 누르면 측정을 멈춥니다. 7. 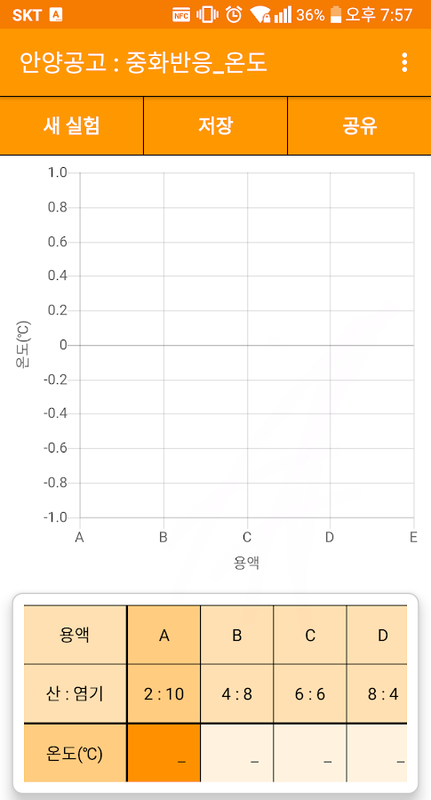 다른 용액(B, C,D, E)에대해서도 위 3~6번을 반복합니다. *블루투스를 통한 실시간 자료(차트) 공유 기능을 추가할 예정입니다. *PaperMBL is the easiest and best MBL (MicrocomputerBasedLaboratory) device. * Please contact us by e-mail to purchasethedevice. [email protected] * This app was created withAppyBuilderand uses Chart.js for charting. Chart.js is open sourceandavailable under the MIT license.http://appybuilder.comhttps://www.chartjs.org *How to use 1.Prepare the sameconcentration of hydrochloric acid and sodiumhydroxide solution.2. Connect the PaperMBL device to the USB portof your smartphonewith the OTG cable. 3. Select the electricalconductivity cell ofSolution A in the app. 4. Mix 2 mL ofhydrochloric acid and 10 mLof sodium hydroxide solution, and insertthe conductivity-measuringelectrode. 5. Press the [Continue] buttonon the PaperMBL unit toupdate the conductivity once every second,and draw the chart. 6.Press the [Continue] or [Single] button onthe PaperMBL unit tostop the measurement. 7. Repeat steps 3 to 6for other solutions(B, C, D, E). * We will add real-time data(chart) sharing functionvia Bluetooth. ※ 빠삭알리미앱 for 빠삭닷컴(http://bbasak.com) 1,폰관련 정보, 정책조건, 모델별, 지역별, 답글,쪽지 푸시알리미 서비스 - 판매자글씨기, 숨어있는 정책조건, 내가 구매하고 싶은 모델별, 내방을 위한 정보, 내글에달리는 답글, 내가 받는 쪽지 등이 있다면 언제든지 푸시서비스 해드립니다. 2,서비스별 ON/OFF 기능 - 각각의알리미는 설정에서 ON/OFF 할수 있습니다. 3,에티켓 기능 - 푸시서비스를 시간대별로 안받기를 할수도 있습니다.4,택배조회 기능 - 내가 주문한 물품이 어디까지 오는지 빠삭알리미앱에서 조회 할수 있습니다. 5,폰요금조회 기능 -내가 사용하는 폰의 요금이 월별로 나오는 금액이 얼마인지 계산할수 있습니다. ※ ppasak Alert app forppasak com (http://bbasak.com) 1, phone information, policy terms,model, region, comments, messages Push Alert Service - For theseller geulssigi, hiding policy conditions for each model, in myroom I want to buy Information and services at any time, if youpush this reply, I receive notes, etc. running on naegeul We will. 2, the service-specific ON / OFF function - Each alert canbe ON / OFF in the settings. 3, Etiquette features - Pushthe service over time can also be a anbatgi. 4, courierlookup functions - Where the goods come from my order it can befound at ppasak reminder app. 5, Phone lookup feature Rates- You can calculate how much money I have to use the phone comeswith a monthly fee. ▶ 실시간TV - 지상파, 종편/보도, 홈쇼핑, 드라마/예능, 영화, 애니, 키즈, 다큐, 스포츠, 라디오 등 다양한컨텐츠 제공 ▶ TV 다시보기 - 드라마/예능/뉴스/시사 다시보기, 종영드라마 무료 다시보기 - 지상파,케이블,종편실시간 업데이트 ▶ 미드 다시보기 - 방영중/완결된 미드 다시보기 - 방영중인 미드 실시간 업데이트 ▶ 애니메이션 -방영중/극장판/완결판 무료 다시보기 - 방영중인 애니 실시간 업데이트 [저작권 관련 공지] - 본 어플리케이션은 영상자체를 저장하고 있지 않으며, 단순히 인터넷 사이트에서 제공하는 링크를 연결해주고 있습니다. - 링크된 모든 영상의저작권 문제는 원저작권자와 영상 정보를 게재한 인터넷 사이트에 있습니다. - 또한 영상 다운로드 기능은 제공하지 않으며,저작권 위원회의 권고 사항을 준수하고 있습니다. [권한 관련 공지] - 인터넷을 사용하기 위해 인터넷 접근 허용권한이필요합니다. [WEBVIEW 관련 안내] - 본 앱은 웹뷰 및 스팸 정책을 준수 합니다. - 본 앱은weebly.com, wordpress.com, wix.com과 같은 웹 빌더와 동일한 서비스인 winksite.com이용하여 개발 되었습니다. ▶ Live TV - Provides various contents such asterrestrial, general / press, home shopping, drama / entertainment,movie, annie, kids, documentary, sports, radio ▶ Watch TV again -Drama / Performing Arts / News / Previews again, ending drama freepreview - Terrestrial, cable, and real-time updates ▶ Back to theMeade - Playing / Replaying Meade - Live mid-air updates ▶Animation - On air / Theatrical version / Complete version - Realtime update [Copyright Notice] - This application does not save theimage itself, but simply provides a link from the internet site I'mconnecting. - All copyrighted images are linked to the originalcopyright holder and to the Internet site where the imageinformation is posted. - We do not offer video downloadingfunction, and we adhere to the Copyright Committee'srecommendation. [Permission Related Notice] - Permission to allowInternet access is required to use the Internet. [WEBVIEW relatedinformation] - This app complies with WebView and spam policies. -This app was developed using winksite.com, the same service as webbuilders such as weebly.com, wordpress.com and wix.com.